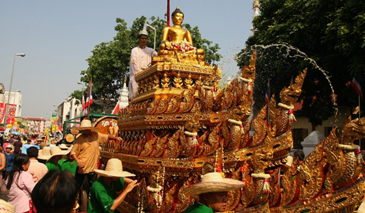 TAT's 2012 Songkran Splendours Festival is a great success. Thailand — The Tourism Authority of Thailand (TAT) has announced that its 2012 Songkran Splendours festival was a great success. The TAT estimates that over 140,000 international visitors and 1.26 million Thais enjoyed the major events that made up the Songkran Splendours festival in 13 provinces including Ayutthaya; Bangkok; Chiang Mai; Chon Buri; Songkhla, the province in which Hat Yai is located; Khon Kaen; Nakhon Phanom; Nakhon Si Thammarat; Nong Khai; Phuket; Samut Prakarn; Sukhothai; and Suphanburi. Estimated tourism revenue generated in these provinces during the Songkran Splendours festival was around 4,572 million Baht. During the first half of April 2012, when inbound tourism traffic builds up for the Songkran celebration, Suvarnabhumi Airport welcomed more than 611,400 international arrivals, up 12.23% from the same period in 2011. Other international airports across Thailand also saw an increase in international arrivals. Phuket Airport welcomed more than 99,500 international arrivals during 1 to 16 April, up 16.82% compared to the same period last year. “Thailand’s world-renowned Songkran festival is an annual highlight for visitors, with joyful celebrations and heartwarming traditions. The famous Thai sense of ‘sanuk,’ which means fun, was demonstrated by the warm welcome extended to the many foreign visitors who joined in the water-splashing festivities throughout the country. There were also plenty of them enjoying the many cultural and entertainment activities at every place where the Songkran Splendours festival took place. This reflects the continued confidence in Thailand as a safe, friendly, and enjoyable tourist destination,” said Mr Suraphon Svetrasreni, Governor of the TAT. This year’s Songkran celebration was lively as usual in Hat Yai, Songkhla province. In addition to the mass water splashing, the largest city in Thailand’s south hosted popular Songkran Splendour activities. The Midnight Songkran Festival also on Niphat Uthit Road and Odian Intersection in Hat Yai were especially popular with foreign visitors this year. The TAT anticipates that the momentum in tourist arrival numbers will continue for the remainder of April, which is Songkran, or Thai New Year, month. During the period of 12 to 29 April, 2012, the TAT expects as many as 6.34 million people, including Thais, expatriates, to contribute a total of 53,200 million Baht in revenue to Thailand’s tourism sector as they travel across Thailand during this period.